Teams to evolve into primary communications client in Office 365 and complement to premises UC platform -- with a goal of enabling a cognitive-powered meeting experience. Amid a slew of announcements Microsoft will be sharing today from the keynote stage at Ignite, its annual user conference, will come official word that, yes, as widely speculated on No Jitter and elsewhere, Microsoft Teams will become the primary communications and collaboration client in Office 365, eventually replacing Skype for Business Online. Along the way, Microsoft would like enterprises to stop thinking in terms of "unified communications," a term it embraced years ago, instead pursuing the idea of "intelligent communications." Core to the intelligent communications vision is Teams, which will morph from a mechanism for group chat into an Office 365 teamwork hub that brings together conversations, meetings, content, Office applications, and third-party integrations (read related article, "From UC to Team Collaboration to Digital Work Hub?"). Teams is going to be the "hero experience," Ben Canning, director of product management for Teams and Skype for Business," told me during a briefing. "Intelligent communications is really all about going beyond just making the connection between people and making the whole experience of communications and collaboration more productive through the integration of intelligence," he said. That intelligence will improve the entire lifecycle of a meeting, pulling insights and data from Microsoft Graph, for example. Prior to a meeting in Teams, a cognitive engine might deliver meeting content or information about participants. During the meeting, it might provide translation or transcription of meeting content, time-coded and using voice recognition to identify speakers, and then afterwards disseminate meeting notes to participants and index content for search (read related article, "It's About the Meeting, Not the Product). Microsoft will be able to achieve this because of its flexible microservices architecture built on the Azure cloud and media delivery network hardened by the billions of minutes of traffic going across the Skype consumer service monthly, Canning said. Additionally, because Teams is built on top of Office 365, actions like creating a channel or joining a group pass into the Office 365 substrate and become part of the audit log -- which is quite important for compliance purposes, he noted. Likewise, Teams can serve up suggestions on groups and contacts based on what it knows about you and your interactions culled from Microsoft Graph. Ensuring interoperability between Skype for Business Online and Teams. "If you're in Skype for Business and I'm in Teams, I will be able to see your presence and you will be able to see mine. We'll be able to chat, and make calls back and forth." Adding audio conferencing so Teams becomes a complete meeting solution -- available for use among internal users as well as with external attendees and for more formal meetings. Enabling PSTN calling from within Teams. 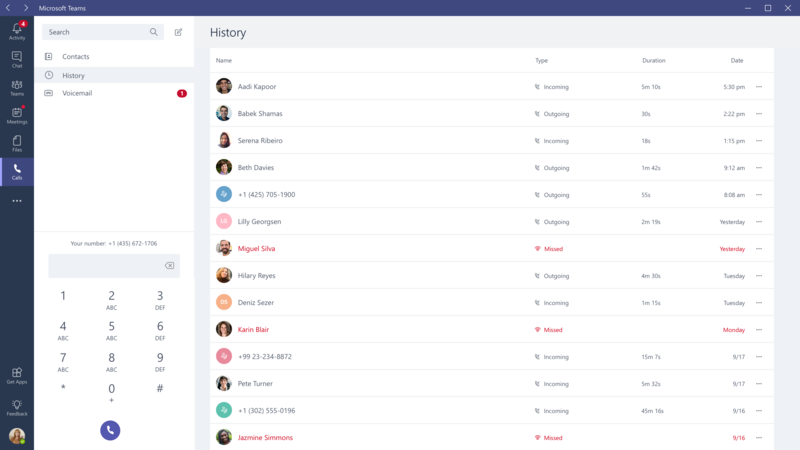 Contacts will port over, as will all of a company's backend setups, such as call queues, auto-attendants, and assigned numbers. "Our vision is that the investments customers have made in Skype for Business voice services are durable as they make the transition to Teams." Providing consistency in administration tools, for call analytics and meeting management. Microsoft's future vision may be all about delivering intelligent communications in the cloud, but that doesn't mean it's going to desert those enterprises that run Skype for Business on premises, Canning said. In fact, its Ignite announcements include notice that it will be launching a new version of Skype for Business Server in the second half of 2018. The focus is on bringing "some of the power of the cloud down to the premises" through call analytics and other cognitive services, Canning said. And Teams, too, should have a future even within companies committed to the Skype for Business on-premises platform, Canning added. "We envision companies effectively running them side by side, with Teams letting you decide which modalities to make available to end users." As an example, a company might rely on Skype for Business Server for on-premises telephony services and one-to-one conversations, but use Teams for group collaboration and meetings. "The two clients would live and work side by side."